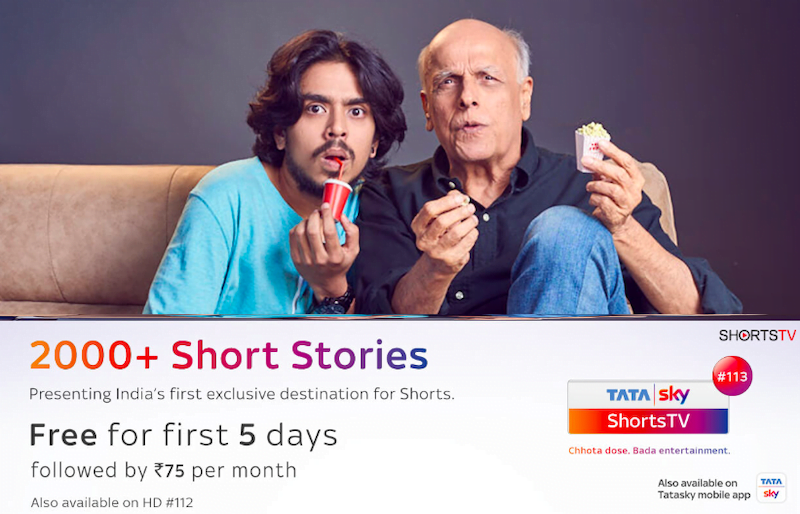 One of India’s top DTH providers Tata Sky has partnered up with the world’s first 24/7 dedicated channel for short films, ShortsTV to launch Tata Sky ShortsTV. The new Tata Sky ShortsTV platform will be exclusively dedicated to short films and stories. This new service by Tata Sky will be the first of its kind in Asia and will provide about 600 hours of new and unique short format stories which the Tata Sky subscribers will be able to access on the go as well. Tata Sky has also detailed that the Tata Sky ShortsTV is a limited time offering and will be available for the viewers until Tata Sky withdraws the platform. The popular DTH provider has also announced that it would be providing this new service for free for a five days trial to the subscribers. Post the expiry of the trial period; the subscription will be chargeable at Rs 75 per month. Tata Sky ShortsTV will provide 2000 premium titles, which will include titles like best of Oscars, Cannes etc. Not only this, but the service will also feature Indian and ingenious shorts stories and films. The short films and stories which Tata Sky ShortsTV will feature will be highly acclaimed ones across the genres of comedy, drama, thriller, mystery, crime and adventure to name a few. Also, Tata Sky subscribers will be able to catch these short films and stories not only on TV, but they will be able to watch them over the Tata Sky mobile app. As per the information provided by Tata Sky, interested HD subscribers of Tata Sky can call 89041 89041 from the Registered Mobile Number to activate this new service, while other SD connection subscribers can give a missed call on 89044 89044. After subscription, the Tata Sky ShortsTV channel will be live on channel 112 for SD subscribers, and on channel number 113 to access the service. So if Somu is on Sky supreme sports kid pack, with rentals of Rs 810 PM, HD access added; how should he make a choice? Asking since a bit lost!